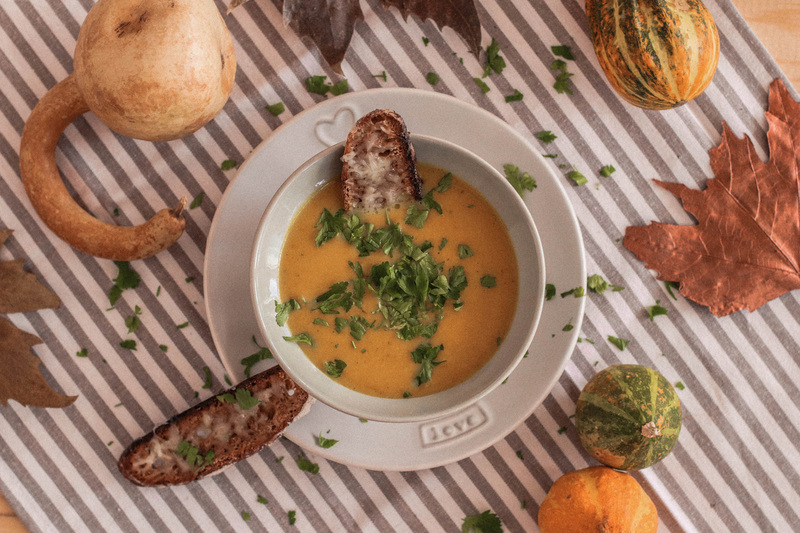 Today I’m sharing with you how to cook one of my favorite soups ever – a healthy full of vitamins Pumpkin Soup. It’s one of my favorite seasons, when fall arrives it’s just getting so beautiful everywhere. The nature is beautifully colored in gold, red, yellow, green and I feel so happy about that. 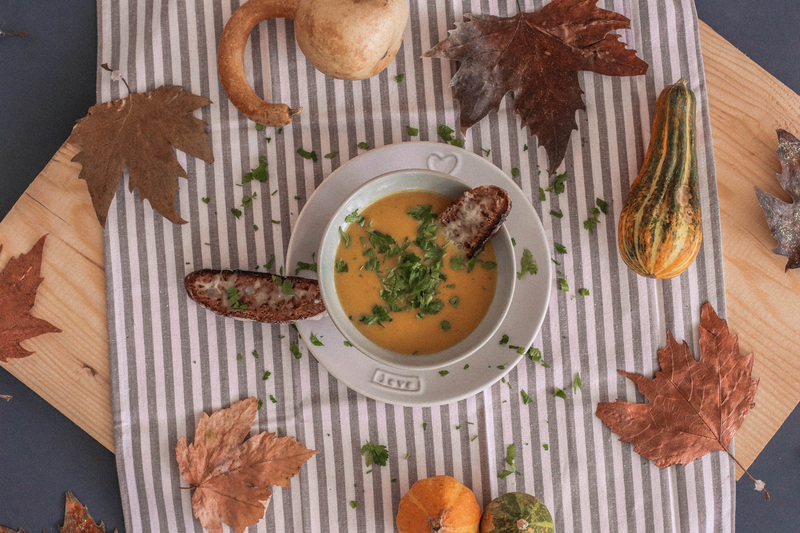 I love fall, not only because of that of course, but also because of the tasty food that’s coming with the change of the weather. 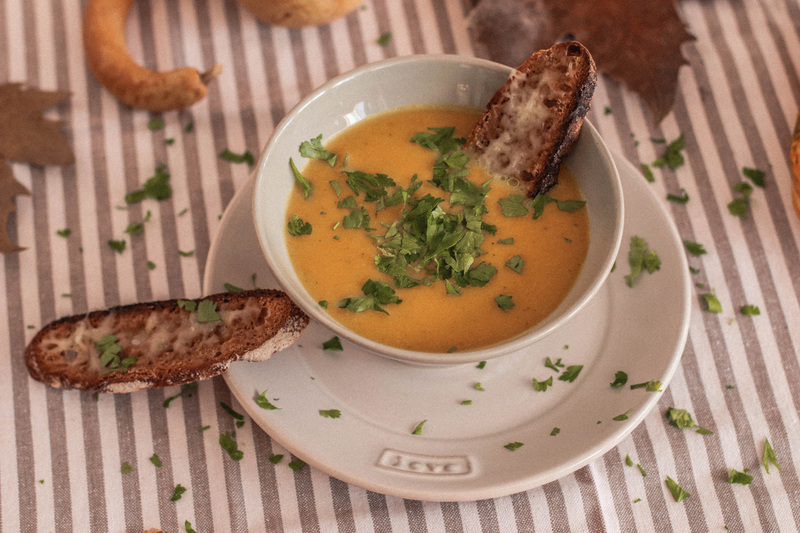 It’s the season of one of the most delicious vegetables – the pumpkin. You can find it everywhere, it’s fresh, very tasty, very healthy and good for you. It’s easy to prepare and you can find different sorts of pumpkin. They’re all very delicious, you won’t regret if you try a new type, you haven’t tried before. 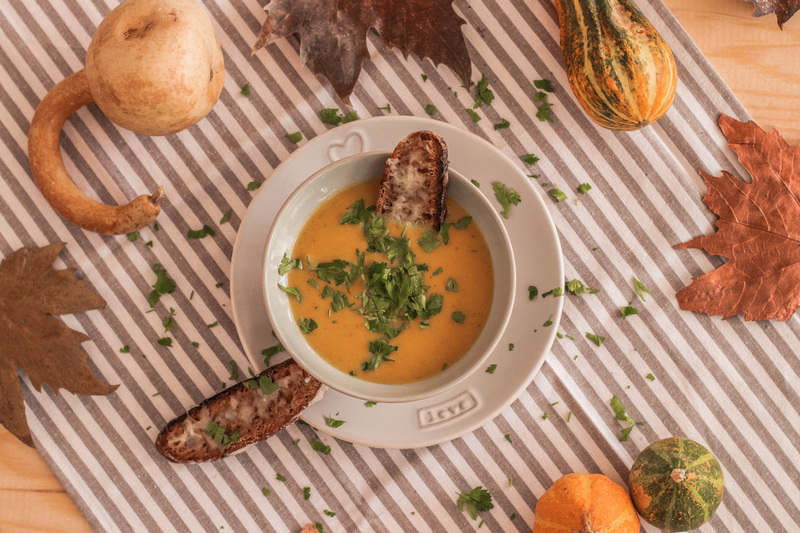 One of the most famous pumpkin sort is the butternut squash. It’s naturally sweet, rich in vitamins, phosphorus, calcium and so much more. Today I’m sharing with you another interesting and very tasty recipe you can cook it in 30 minutes, it’s very delicious and very good for your health. Here’s how to prepare it. Heat the olive oil in a large stock pot, medium heat. Add the leeks, onion, carrot, potato, curry, turmeric and herbs and sweat the aromatics until translucent, about 10 minutes. Add the pumpkin cubes and the vegetable broth and bring to a boil. Reduce heat to a simmer, cover and let simmer until the pumpkin is tender, about 20-30 minutes. Puree using an immersion blender (you can also use a food processor or blender, if you puree in batches). Swirl in the butter (ghi) and the milk. Add the nutmeg and ginger then taste and adjust the salt and pepper if needed. * The soup is better the next day and even better the following day. Prior to serving, preheat oven to 180 C degrees. Butter the baguette slices lightly with butter. Toast on one slide until lightly brown, just a few minutes. Turn over and toast for another minute or two. Remove slices from oven and top with a little sprinkle each of chopped fresh Thyme and grated cheese. Put back in oven and toast another few minutes until cheese has melted. Нагорещете зехтина в голяма тенджера на средна температура. Добавете нарязаните на ситно праз, лук, моркови и картоф, поръсете с кърито, куркумата, мащерката и розмарина и оставете да умекнат и поемат аромата на подправките около 10 минути. Добавете нарязаната тиква, зеленчуковия бульон и увеличете температурата докато заври. Оставете да ври около 20-30 минути на средна температура докато тиквата омекне. Пюрирайте, използвайки пасатор или блендер. Добавете разтопеното масло или гхи, заедно с млякото, джинджифила и индийското орехче. Разбъркайте добре и овкусете със сол и черен пипер на вкус. Загрейте фурна на 180 градуса С преди да сервирате. Намажете филийките с малко масло и поставете във фурната докато се запече до леко златисто и от двете страни. Извадете филийките от печката и поръсете всяка филийка с настърганото сирене и нарязаната мащерка. Поставете отново във фурната за няколко секунди, докато сиренето се разтопи леко. Гарнирайте супата с 1-2 филийки.